When it comes to interviews it is not only those applying for the job that needs to make a good impression. Recruiters and hiring managers need to put their best foot forward too. And you could be losing some potentially talented candidates without realising it. 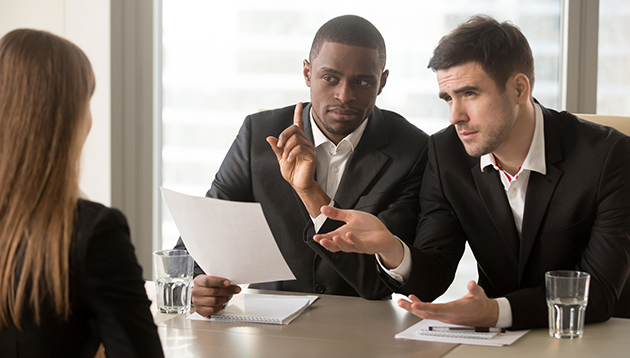 Take a look at these common mistakes recruiters make to make sure you don’t lose your perfect candidate in the next interview. This rule is a two-way street, where being on time is critical for making a good impression as an interviewee. However, hiring managers will often leave candidates waiting while they make a few more phone calls or answer another email. Most people will understand if there is an emergency but don’t make being late a habit. Interviews should start on time, no matter what. You might have a ton of things to do but when you are conducting an interview, you should give it your undivided attention. Answering emails, calls or checking your phone is rude and shows a lack of respect to the person you are interviewing. It also means you could potentially miss something in their body language or attitude when deciding if they are a suitable fit. One of the most common mistakes is to set unrealistic expectations when trying to fill a job opening; four degrees, 10 years of experience, and fluency in three languages. And these can carry over to a job interview, having standards is one thing, but be realistic, there could be some great talent you’re missing out on because you haven’t given them a chance. Make sure you understand every aspect of the job even if you didn’t write the description. From the day-to-day tasks to how the role fits into the bigger picture. Ambiguity will turn candidates away and it will be pretty obvious if you don’t know what you are talking about. Make sure to ask relevant and pertinent questions for the role. For example asking about teamwork makes sense in marketing and advertising but not if the role is as a truck driver. If the questions are too personal you will just come off as creepy and unprofessional. There is nothing more off-putting for a candidate than an unprepared hiring manager. Sitting down when it’s clear you haven’t looked at their CV will give potential candidates a terrible impression of the company and that you are not really interested in your job, so why should they be in theirs? It will make the hiring process much longer too. Hiring is an essential part of your business but remember the candidate isn’t on trial. Having a sense of humour and a smile can break the ice, set the tone of the office culture and help get the best out of the interviewee. It might be obvious to remember to be polite but sometimes interviewers start firing questions like its the Spanish Inquisition. This can make candidates nervous where they feel like its an interrogation and that could cause you to miss out on someone really talented. You might be doing some of these without realising it but there are also more serious mistakes hiring managers can make. For instance ageism, sexism, racism, and other actions that could land you in legal hot water. Be professional and keep an open mind.